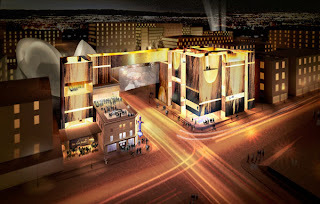 It won't be long before Allied Works of Portland unveil their architectural plans for the eagerly awaited National Music Centre at the King Eddy Hotel in the East Village. After winning out over four other international finalists last fall with their 'building as instrument' proposal, Allied Works have been busy collaborating with the folks at the Cantos Music Foundation to arrive at the next stage of development. Many have high hopes for this Centre, which will act as a gateway for the East Village – the vibrant up-and-coming inner city community in the heart of Calgary. 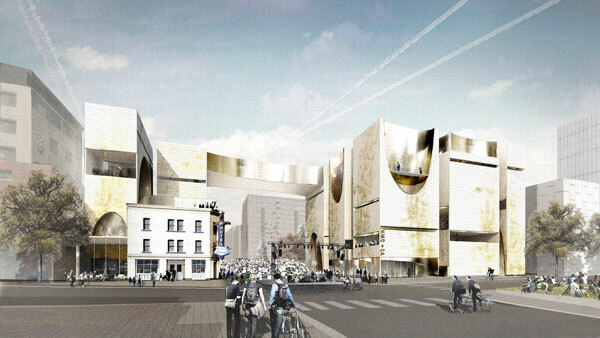 I've been a fan of the Cantos Music Foundation for some years now, and have recently had my attention riveted to its transition into the National Music Centre (NMC) with the much publicized international design competition that included entries from Paris, New York, Montreal and Los Angeles. It was a pleasure to see such high caliber architectural firms bidding on a project here. Taking nothing away from our amazing local architects, we should be proud that Calgary is drawing the attention of well-known internationally acclaimed design firms. There's plenty of room for a few more architectural gems. On the topic of gems, currently one of the city's hidden gems (it won't be for long), the Cantos Music Foundation houses an extensive collection of historical and contemporary musical instruments and offers a highly regarded selection of educational and outreach programs. Much loved by those who know it, with the construction of this handsome new facility, it is poised for much deserved fame. Cantos' tireless executive director, Andrew Mosker, graciously took time from his busy schedule to chat with me about the project's progress. Whether your iPOD features hip hop or classical, jazz or folk, Andrew has your number. The vision of the NMC is to reflect Canada's unique music story, to resonate with all music lovers no matter what your style. No isolated monument, the construction of the NMC is hoped to spark more development in the East Village and perhaps create a music district for the city. This is a $130 million project ($105 m for the building and $25 m for an endowment fund), so fundraising is top of mind for Andrew and his staff. With $25 million already promised by the municipal government, they are eager to launch a national fundraising campaign in early 2011. The target completion date is set for 2012/13, hoping to piggy back onto the 100th anniversary of the Calgary Stampede celebrations. If you would like to find out ways you can donate to the campaign, visit Cantos.ca. Look for the Music Centre's new brand created by Identica to launch this fall. Andrew spoke with me from Ottawa where he's been busy raising funds and forging partnerships with groups like the National Library + Archives. In his quest to make this a truly Canadian experience, Andrew is focusing on building relationships across the country, from the Country Music Hall of Fame to the Juno Awards organization – to gather together the nation's music lovers and provide them with a place to share their love of music. The NMC includes a partial historic preservation of the much-loved King Eddy Hotel, once home to the famed blues club. 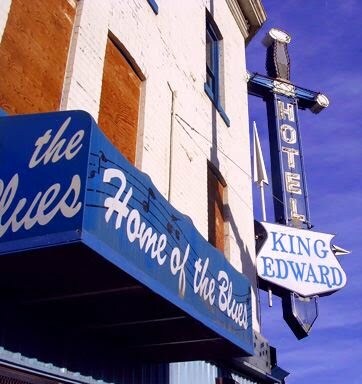 Originally slated for knock-down, groups like the Calgary Heritage Initiative and Cantos spotted potential in the run-down space. Perhaps they could recapture some of the historic musical moments of the past by including portions of the building in the plans for the Music Centre. Any time a historical building in Calgary is saved is a day to cheer considering how cavalier we've been in tearing them down in the past. Bravo Cantos. Not only will it be saving a bit of local history, the Centre will be displaying an amazing instrument collection (with heavy concentration on the newly coordinated keyboard collection), providing a space for live music, recording studios, a radio station, as well as educational spaces with room for 12 artists in residence. It will be unlike anything Calgary has seen before (Canada for that matter) and will offer a great reason for us to spend more time, outside of business hours, downtown. Brad Cloepfil and his team at Allied Works have their work cut out for them, but they're certainly up for the challenge, having completed several high profile cultural and commercial projects in the past. Projects like the offices for ad agency Wieden + Kennedy which quickly became the catalyst in the re-development of a formerly industrial area (sound familiar?) into the now successful arts district in Portland. They are just what the East Village needs. I could go on more about the East Village but I think I'll save that for another posting. Like Allied Works past projects, here's hoping the Canadian Music Centre is the catalyst for further development in, what could become, the hippest part of town. A national treasure right in the heart of our city. Isn't that music to your ears?